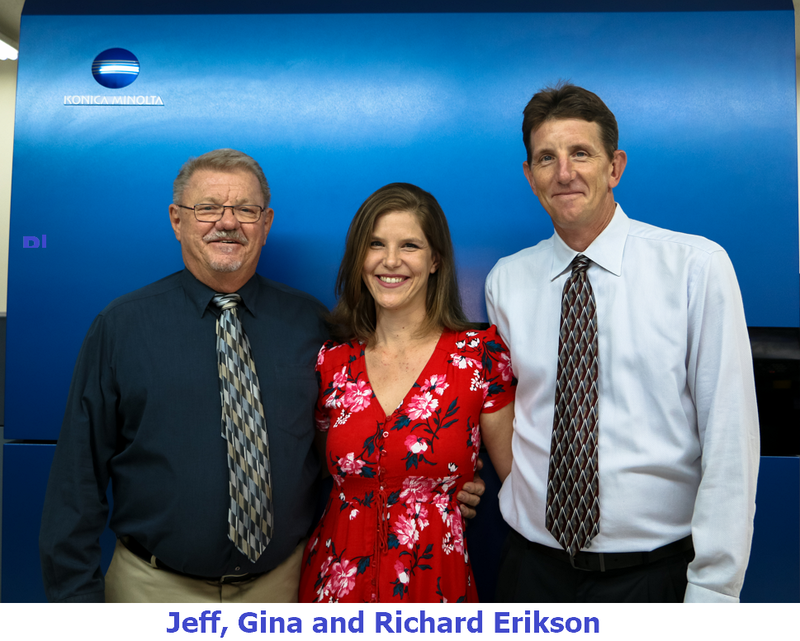 The OutputLinks team had the pleasure of interviewing Panoramic Press’ owner Jeff Erickson, and his son, Panoramic’s VP of Sales, Richard, who are carrying the family tradition of excellence in print into the future with the addition of a Konica Minolta AccurioJet KM-1 Inkjet Press. Phoenix-based Panoramic Press recently celebrated its 60th anniversary as a provider of quality printing services. Over the years, the business has grown from a small six–employee shop that operated primarily as commercial offset printers to a multi-facility family-run business providing services that include folding carton manufacturing, full mailing services, die cutting, and fulfillment. Jeff describes the family experience in learning the print business. Panoramic Press is proud of its customer relationships. Whether spending extra time consulting and advising before a job is finalized, or catching potential errors before printing is started, going above and beyond for customers is an everyday event. This effort is recognized and rewarded in customer loyalty; they have customer relationships that span multiple generations, with one reaching the 50-year mark. Richard Erickson understands what it means to stay relevant in the rapidly evolving world of commercial print. Before setting out on their search for their next technology acquisition, the Panoramic team did their homework. They looked at the range of jobs they were producing, paying particular attention to run lengths. They cataloged the work on their existing presses and identified work that could be produced more efficiently on a quality digital platform. They also looked at the increase in variable data work, the demand for short-run, high-quality output like photo books, and their sizable packaging sector. Richard shared his findings. “I analyzed the last 1,100 jobs run on our 5-color 20” x 28” press, and the average press run was only 1,470 sheets. There is no way to be competitive with conventional offset printing on press runs of that size.” This was the time when a move to digital high-quality ink jet began to crystallize. In addition to an increasing amount of short-run, variable data work, it was critical that any machine they acquired needed to handle the existing carton and packaging work. This work makes up approximately 30% of Panoramic’s business, and it is an area that they are looking to grow. A digital inkjet press with the ability to handle an extended range of substrates and material types was high on the evaluation checklist. Panoramic Press set about to determine the best inkjet/B2 sheet digital printer for their environment. Knowing that whichever machine they purchased would be a major part of the company’s future, they conducted extensive research and testing with the HP Indigo 12000, the Fuji J-Press, and the Konica Minolta AccurioJet KM-1. This investigation revealed that Panoramic would be able to produce at least 75% of the work currently running on their 20” x 28” machine and a large portion of the output from its 13” x 19” press more efficiently on the KM-1. Operationally, the AccurioJet KM-1 will eliminate large quantities of make - ready sheets and set up time, which will drastically reduce costs and increase profitability. Both Jeff and Richard see the future of their business the same way. Their experience and industry data tell them that the increase in short-run, quick turnaround jobs will continue to grow, and the more traditional commercial press work will continue to decrease. The packaging component, currently at around 30% of the business, is an area for continued expansion and growth. The AccurioJet KM-1, with its media flexibility and wide array of capabilities, can support those growth areas while bringing additional profit opportunities in direct mail, photo books, canvas, cards, and other non-traditional material-based print. There is a great potential for Panoramic to increase its offerings to the existing customer base and expand its client list by leveraging the new capabilities of the KM-1 Press. Their sales team is already in discussions with several companies who produce high-end, short – run color books, and have received a tremendous response from existing and potential new customers. Jeff sees that the future of Panoramic Press as being in capable family hands. Consistent actions, like the KM-1 Press addition to keep the business relevant and valuable to clients, will continue to pay dividends for many years, and possibly generations, to come. "Konica Minolta and Panoramic Press are completely aligned in our dedication to delivering the very best in quality print with the AccurioJet KM-1 Press," explains Bill Troxil.” Sr. Vice President, Strategic Business Development at Konica Minolta Business Solutions U.S.A., Inc.," We are committed to our partnership with Panoramic Press and this multi-generation family’s exciting next phase of growth with the KM-1.